Queensland Fruit Fly season is upon us so it’s important that all of us, from tourist to home gardener to commercial producer, are vigilant about our fruit handling to prevent an outbreak. If you buy fruit while visiting a regional area, don’t bring it home. If you’re a home fruit grower (including ornamental fruit) make sure you pick fruit regularly and dispose of any dropped fruit. Commercial growers are encouraged to increase fruit inspections and put into practice baiting and hygiene procedures. 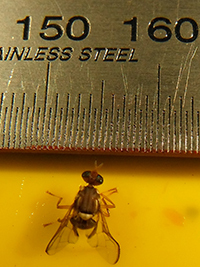 Queensland Fruit Fly traps can be purchased from most hardware stores or made using a plastic bottle a few pantry staples (see https://www.pestfreearea.com.au/recipes).